Forced to wait more than 20 years to become pharaoh, Tuthmosis (reigned c1458 - 1425 BC) was a man in a hurry when he finally took power. His military victories made Egypt one of the richest countries on Earth. When his father died, Tuthmosis was just a young boy. His stepmother, Hatshepsut, was regent until he grew older, but then seized the throne and ruled as pharaoh herself in his place. 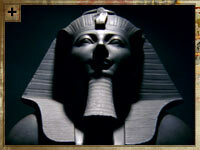 Tuthmosis was denied his throne until Hatshepsut died, more than 20 years later. Egypt was powerful, but it still had many enemies. The death of a pharaoh presented them with a perfect opportunity to test the strength of the new leader. A coalition of foreign princes gathered in the city of Megiddo, threatening Egyptian trade and influence in the area. Perhaps they thought that Tuthmosis would be weak or hesitant: if so, they were seriously wrong. Having waited so long for power, Tuthmosis had big plans. He had been head of the army before he took the throne and knew that military victory was the best way to popular acclaim and immortality. He didn't just want to defend Egypt against its enemies; he wanted their lands for himself. He enlisted 20,000 soldiers - either voluntarily or by force - and trained them for an attack on Megiddo. 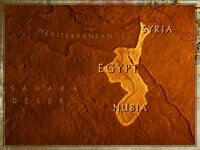 The army marched across the Sinai desert and up the Mediterranean coastline. Along the way, a team of scribes - the world's first war correspondents - recorded the army's progress and victories, and gave an idea of life in the pharaoh's army . When the army arrived at Megiddo, Tuthmosis had to figure out his plan of attack. Against the advice of his generals, he decided to take the most direct - and most dangerous - route to the city, figuring that the enemy would not expect him to be so bold. He was right. His attack surprised the enemy army, which was camped outside Megiddo, and he quickly defeated them. Tuthmosis lost momentum, however, when his army stopped to plunder the enemy camp. This allowed the survivors to escape and hide behind the walls of the city. Now he had to sit it out. For seven months, Tuthmosis and his army kept the city under siege while raiding the surrounding countryside. With its population starving, Megiddo finally surrendered. The city and its people now belonged to Tuthmosis, along with all its wealth. The war booty that Tuthmosis brought back to Thebes made it one of the richest and greatest cities in the Ancient World. Tuthmosis also had the clever idea of bringing back the children of his defeated enemies. As they grew up, they were sent back to replace their fathers as part-Egyptians, not enemies, cementing Egyptian rule. In the important gold-producing region of Nubia, originally conquered by Ahmose, Tuthmosis went one step further to secure control. He appointed a viceroy to rule over the area. The viceroy - the "Overseer of the Gold Countries" - ensured that Nubia's gold poured into Thebes giving Egypt all the gold it needed to rule its new empire. Just 100 years earlier, Egypt had been on the verge of extinction. Tuthmosis changed all that. He conquered more land than any pharaoh before or after. 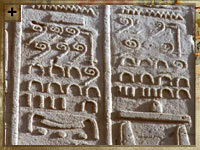 By the end of his reign, Egypt controlled Nubia, the Syrian and Lebanese coasts and vast areas of Israel and Palestine. It was the biggest empire ever conquered and ruled by one king.